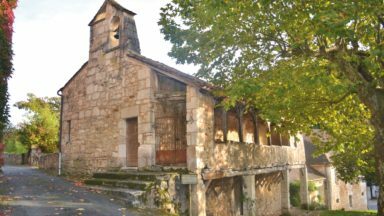 Guide to over 30 walking routes around the Cathar castles of south-west France, reminders of religious turmoil from 1000 to 1250. Routes from 16 centres, including Béziers, Minerve, Lastours, Foix, Roquefixade, Lordat, Montailloe, Puivert, Montségur, Usson, Puilaurens, and Rennes. Possible year round, but the winter wind (tramontane) is blustery. Height of summer can be very hot lower down. Béziers, Narbonne, Perpignan, Carcassonne, Foix, Quillan, Ax les Thermes and many small towns associated with the Cathar Castles. From half- to full-day walks. Most are straightforward, but includes some longer and tougher routes and even a scramble. It's all about the castles really, with Béziers, Minerve, Foix, Montségur, Roquefixade, Peyrepertruse, Puilaurens and many others. 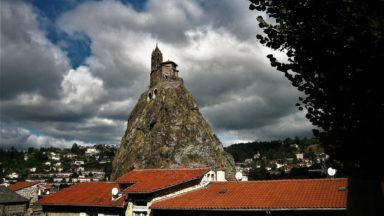 The guide offers 30 walks based on the once strategically important castles that dominate the foothills of the Pyrenees. 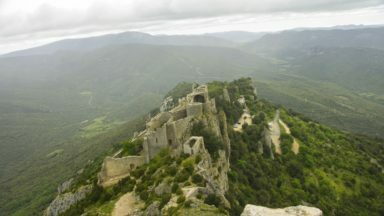 Each walk has as its focal point a castle or other location associated with Cathar history (mostly the 13th century). Summaries of the historical connections of each location with the Cathar period are given, and together these relate the story of the downfall of the Cathar Church, from the massacre in Bèziers in 1209 to the siege at Montsègur in 1244, which ended with the burning alive of over 200 believers who refused to renounce their Cathar faith. The sketch maps accompanying the walk descriptions in this book are intended only to offer an indication of the key features in the areas crossed. It is strongly recommended that walkers also equip themselves with the relevant 1:25,000 maps published by the Institut Géographique National (IGN), the French equivalent of the Ordnance Survey in Britain. These excellent maps contain very detailed topographical information. Each walk description specifies the 1:25,000 map (or maps) which cover the relevant area. There are two types of 1:25,000 map. Maps in the Serie Bleue series each cover an area of about 15km x 20km. Maps in the Cartes topographiques TOP 25 series vary in size but typically cover an area of about 27km x 22km. The TOP 25 maps show long-distance paths, local walking routes and a lot of other valuable tourist information, much of which is not shown on the Serie Bleue maps. They cover coastal, mountain and other tourist areas. In Cathar castle country, most of the 1:25,000 maps are in the TOP 25 series. A grid of numbered kilometre squares covers the maps of newer editions of both 1:25,000 series. The newer editions can also be used with global positioning devices (a GPS symbol is shown on the front). At the time of writing, about two-thirds of the 1:25,000 maps referred to in this book are GPS-compatible. The newer editions of all 1:25,000 maps are also being marketed as Cartes de randonnée (walkers’ maps). Many newsagents, bookshops and supermarkets in France sell IGN maps. TOP 25 maps cost around 10€ each (about £7), while a Serie Bleue map costs around 8€. The publisher Rando éditions has produced a series of 1:50,000 maps covering the French Pyrenees and their northern foothills, using IGN cartography and also called Cartes de randonnées. In this series, no 9, Montségur, covers an area between Quillan and Foix and is useful for planning walks in the area. It costs around 10€. The IGN also produces a series of 1:50,000 maps, but these are not usually available in shops and, for walkers, are no adequate substitute for 1:25,000 maps. For route-planning purposes the IGN’s series of 1:100,000 maps (the Cartes topographiques Top 100 series, or Cartes de promenade) is very helpful. Nos 71 (St-Gaudens Andorre) and 72 (Béziers Perpignan) cover most of Cathar castle country. IGN’s 1:250,000 maps (Cartes régionales series) are also designed for route planning by road. Cathar castle country is covered by Midi-Pyrénées (R16) and Languedoc-Roussillon (R17). In France, the 1:100,000 and 1:250,000 maps currently cost around 5€ each. IGN’s website is www.ign.fr (in French only). Their maps and other products can be bought via that website using a British credit card. But, with the additional postage and cost of currency transfer, their final prices seem to work out a little higher than those charged by British suppliers of the same maps. 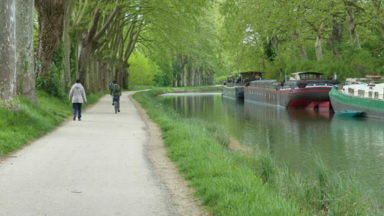 A reader has reported problems on the route of Walk 15, Rennes-le-Château. With reference to the route map on page 187 of our book, the difficulty (which was of the barbed wire variety) was encountered on the section between points 7 and 8. It seems as if one or more owners no longer want people to walk on this route (which may not be a public right of way). - Walk from Couiza up to Rennes-les-Château, as described in the book between points 1 and 5, then return by the same route. That is a good morning's walk. For an afternoon outing on the same day, walk from Couiza out to Coustaussa and back, also on the route described in our book, between points 1 and 9. The route between Couiza and Coustaussa is indicated by yellow waymarks and is described in a leaflet that you can find on this web page: www.paysdecouiza.com/randonnees/pdf/fiche-randonnee-4.pdf. 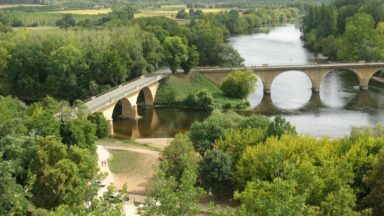 - Try a completely different walk, starting at Rennes-le-Château. This is a circuit of 13km, known as the Circuit du Ritou, which follows a waymarked route in the hills south of Rennes- les-Château. 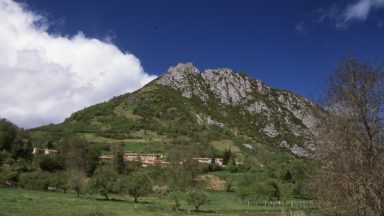 It is described in a leaflet that you can find on this web page: http://www.paysdecouiza.com/randonnees/pdf/fiche-randonnee-7.pdf. After descending a fairly steep slope, the path meets a track where you turn left (3). Where the track forks a little further ahead, go right, and soon approach a lake in an open area. This is on the edge of a campsite. Notices may tell you it is private property. If all is well, you should be able to go straight ahead, past the lake. (Formerly, the route was diverted to follow slightly higher ground on the right. If the route is waymarked to follow that diversion once again, follow the waymarks.) About 200 metres after the lake, take a turning on the left (if you follow the diversion, the routes rejoin at this point). The track goes downhill and crosses a small wooden footbridge over a streambed (4). The latest edition of the guidebook in French to the Sentier Cathare, published by Rando éditions, appeared in 2011 at a price of 9.90 euros. Also published in 2011 by Rando éditions was an excellent map at a scale of 1:55,000, showing the route of the Sentier Cathare. That map also shows the routes of many local circular walks, including some that appear in this book. The map currently costs 9.95 euros. Pages 68 and 73: where the walk follows the Sentier Cathare, the waymarking is now red and white, not red and yellow. Between point (6) and just before point (9), the Tour du Pays d’Olmes (indicated by red and yellow waymarks) has been diverted to a route that winds uphill through the forest to the north-west of the route described in our book (ie, the route that goes past point (8)). The new route is longer, but is less steep and, in wet conditions, is less slippery than the route described in our book. You may prefer to follow this new route. But take care to follow the red and yellow waymarks – the new route is not yet shown on the IGN 1:25,000 map. The waymarks between Montferrier and Montségur (on the Sentier Cathare) are now red and white, not red and yellow. "...The soil here is in places almost bright orange. The vineyards become sparser and on both sides of the track there is now mostly dry, scented Mediterranean scrub. The Sentier Cathare soon branches off to the left, to climb a steep slope. The route of this walk formerly went straight ahead, to pass a smallholding, but it is now best to follow the Sentier Cathare and climb the slope on the left. You eventually rejoin the former route of this walk at a path junction. Turn left there and continue to climb. The ground is rocky in places, and it can be slippery after rainfall, so take great care here...."
"... One theory is that Saunière financed all this after discovering Cathar treasure which had been smuggled out of Montségur just before its capitulation and which had been hidden in the churchyard at Rennes-le-Château. But there is no shortage of alternative theories, including some which revolve around Visigothic treasure, the Holy Grail and plundered gold. However, the writer Jean-Jaques Bedu has argued persuasively that Saunière really obtained much of his wealth from a fundraising strategy based on a trafic de messes. To the consternation of his bishop, Saunière successfully solicited, and retained, payments from all over France for saying masses for dear departed loved ones. Nevertheless, the mystery of Saunière's treasure persists - if only because people love to believe that a mystery remains to be solved." Axat should be on the road between Quillan and Usson, not just to the right of it. Also there is now no railway service between Axat & Quillan. The telephone number should now be: (00 33) (0)5 34 09 83 83. There is at present no convenient alternative route here. ‘Former Ramblers Director Alan Mattingley retired to southern France several years back, but this little book demonstrates he is still putting his walking expertise to good use. It explores the beautiful and evocative eastern corner of the Pyrenees associated with the Cathars, a mystical and egalitarian Christian sect, who were ruthlessly suppressed as heretics by the Roman Catholic church in the 13th century. The looming castles where the Cathars hid from their persecutors, some of them seeming to grow from the rock of their hilltop perches, provide the bases for a varied range of day walks using the extensive waymarked footpath network in the area as well as parts of the long distance Sentier Cathare. Alan Mattingly was director of the Ramblers' Association from 1974 to 1998. He has also held various other posts in the outdoor field, including that of chairman of the Council for National Parks. He is now based in a small town in the eastern Pyrenees which lies just below the 9,000ft Pic du Canigou. When not exploring the Pyrenees on foot, Alan writes and also teaches English. 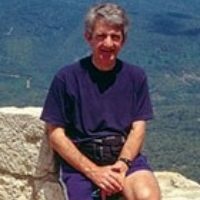 He is author of Walks in the Cathar Region published by Cicerone. Hidden Gem – have you ever visited the Cathar castles of southern France?